Q1: How to definite N-key rollover keyboard? A1: A computer keyboard circuit that allows any number of keys to be pressed in succession without having to lift a finger from any of the previous keys. Only a small number of high-end keyboards have n-key rollover. Most have 3-key rollover, which is essential for touch typing. The Braille2000 application requires 6-key rollover for entering Braille because as many as six keys may be depressed at one time. How to test the Rollover? To test the rollover, press as many keys as you can on at least two different rows simultaneously. If they all display on screen, the keyboard has sufficient rollover for that number of keys. It is difficult to test n-key rollover with two hands. It requires the use of a ruler or edge of a book to depress that many keys. What's different between Digimore's capacitive keyboard, N-Key rollover and others ? To be N-Key rollover support, current solution is to use mechanical key switch which of cost is quite high. Our KB-801N is 1st membrane-type capacitive keyboard in the world. Thanks to break-through technology, it is not necessary to use expensively mechanical key switch to be ghost-key free. With our patented capacitive membrane sheet (see right diagram), the conventional key switch can also work like capacitive keyboard with friendly price. Q2: What is the capacity keyboard? A2: Capacitive keyboard uses changes in capacitance, or stored static electricity, to register when a user has pressed a specific key on the keyboard. The other type of keyboard called contact keyboard uses changes in flows of electricity to register. Under the keyboard keys of the capacity keyboard are capacitors that store electricity as opposite static charges in pairs of conductive plates made from nickel-plated copper that are separated by a non-conductive material. The opposite static charges hold an attractive field between them, but the insulating material prevents the charges from canceling each other out by coming together. When a key is pressed, the pads move closer to each other and change the capacity for storing a charge, which the keyboard detects as a start or stop in the flow of electricity and inputs the correct keystroke. Q3: What is the Scissor-type keyboard? A3: A special case of the computer keyboard dome-switch is the scissor-switch. The keys are attached to the keyboard via two plastic pieces that interlock in a "scissor"-like fashion, and snap to the keyboard and the key. It still uses rubber domes, but a special plastic 'scissors' mechanism links the keycap to a plunger that depresses the rubber dome with a much shorter travel than the typical rubber dome keyboard. 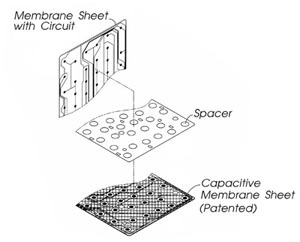 Typically scissor-switch keyboards also employ 3-layer membranes as the electrical component of the switch. These stabilizing scissor-like devices extend the lifespan of the membrane to as much as 10 million keystrokes. They also usually have a shorter total key travel distance (2 mm instead of 3.5 – 4 mm for standard dome-switch keyswitches). This type of keyswitch is often found on the built-in keyboards on laptops and keyboards marketed as 'low-profile'. These keyboards are generally quiet and the keys require little force to press. Q4: What is multi-link/ multi-host switchable Bluetooth keyboard? A4: Multi-link/ Multi-host switchable Bluetooth keyboard control multiple Bluetooth enabled devices from one keyboard. All our Bluetooth enabled products built-in HTN display will memorize up to 8 Bluetooth hosts and quickly switch between each other. Users can pair the device with Smart Phone, Tablet PC, Notebook and other Bluetooth enabled host devices which support a HID profile. 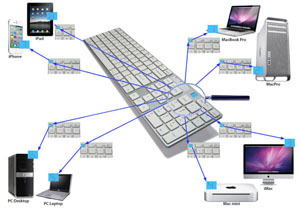 Hereafter is the illustration for multi-link/ multi-host switchable Bluetooth Keyboard.